Is Xi'an city worth visiting? Xi'an in China's Shaanxi Province is best known as the home of the ancient Terracotta Army. We discovered that Xi'an is a buzzing city with lots going on when we visited as part of an extended trip six week trip through Asia (#DrJSabbatical). Check out some of the fun things to do in Xi'an apart from the obligatory visit to see the terracotta warriors. SIDEWALK SAFARI SPOTLIGHT: Did you know that the UNESCO World Heritage Ancient City of Pingyao is worth visiting and is an ideal stopping off point to break up the journey between Beijing and Xi'an? Xi'an's Muslim Quarter is a sight to behold. Street food vendors line the main strip making some of the freshest food you'll find. We saw several butchers carving out meat for skewers on the spot. Other vendors work their dough with theatrical flair. Soups and dumplings steam in pots heated over open flames. We stopped for dinner at a dumpling place along the main street in the Muslim Quarter. Each one was filled with meat and soup and served with a spicy sauce. The Bell Tower in Xi'an sits in the middle of a very busy traffic circle. Fortunately, you buy your ticket and gain access to the Bell Tower through the underground passage connecting the metro and various points in the city center. The Bell Tower has impressive painted columns. When we visited, there was a display of period furnishings and artwork being exhibited. Historically, the bell was struck at dawn to mark the sunrise. Xi'an's Drum Tower is worth a quick visit. Admire the architecture and period furniture inside; the Drum Tower in Xi'an dates back to 1830. Historically, the drums were beaten at sunset to mark the end of the day. Speaking of sunset, Xi'an offered us a few beautiful evenings. 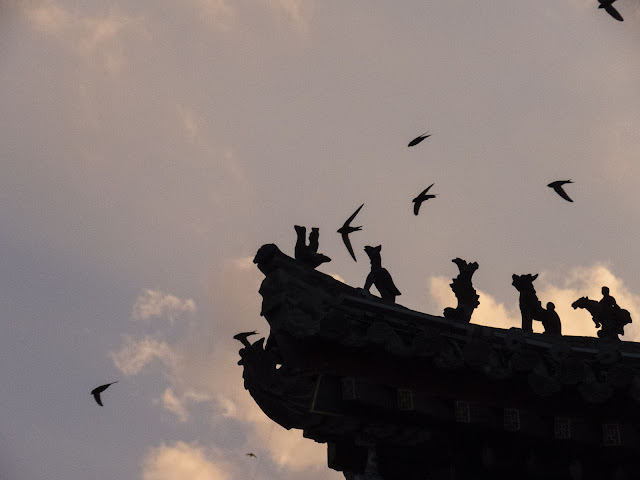 In particular, we had an amazing time watching swifts dart in and out of the eaves of the Drum Tower at dusk. Xi'an simply lights up after dark. Check out the bastions of the intact city wall. Both the Bell and Drum Towers in Xi'an are also impressively lit when the sun goes down. It's like visiting a different city. Xi'an is a university town and we saw way more westerners than we had in other parts of China as a result. Inside Xi'an Brewery, we could also imagine we were in a western city drinking a craft beer. Xi'an Brewery makes a variety of their own beers in house. Pints are served up with the spiciest peanut snack mix I've ever had. Yum. We visited on a weekend evening and a band was playing a mix of jazz and popular music from the U.S. It was a little disconcerting to hear singing in English when we'd encountered so few English speakers in our nearly 2 weeks in China. Chinese cities love to put on an over-the-top show light or water show and Xi'an was no exception. We made the pilgrimage to the world's largest fountain show in Xi'an near the Giant Goose Pagoda and got to watch water dance for about 15 minutes. While we were in the neighborhood, we bought a ticket and went inside the Giant Wild Goose Pagoda. The pagoda itself was build more than 1350 years ago in 652 and is a Buddhist temple. The grounds surrounding the temple are a lovely spot for a peaceful walk. There you have it. It's easy to fill a few days in Xi'an beyond visting the Terracotta Army. 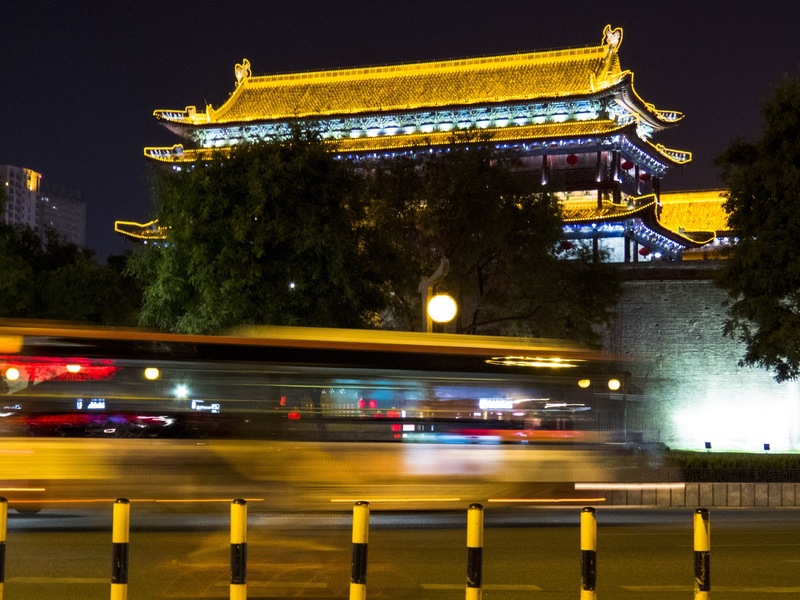 Have you taken a trip to Xi'an? What were your impressions? 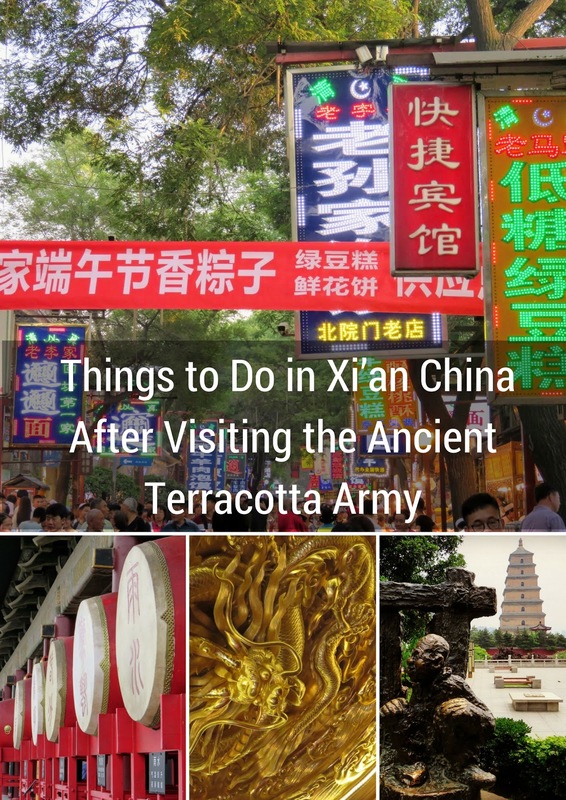 Learn about things to do in Xi'an China (part of Shaanxi Province) after visiting the Terracotta Army. Enjoy Xi'an food in the Muslim Quarter. 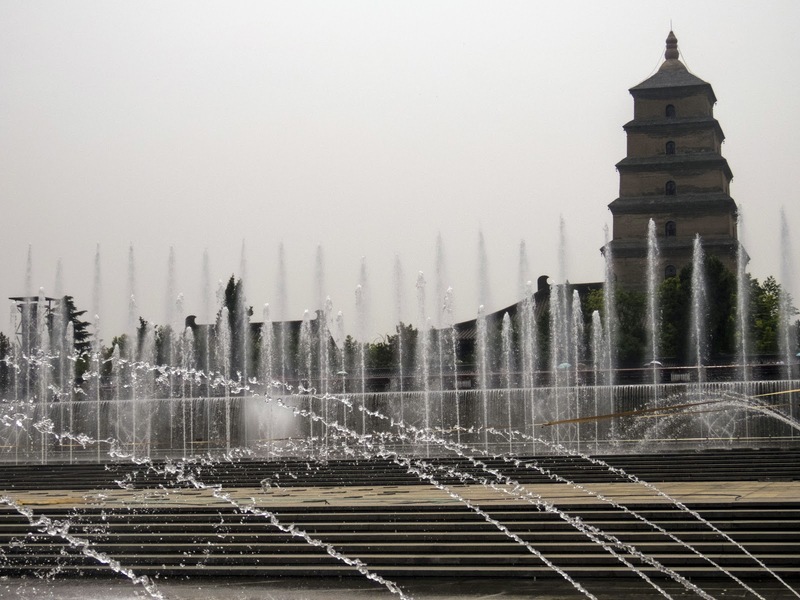 Discover why Xi'an China is worth visiting.